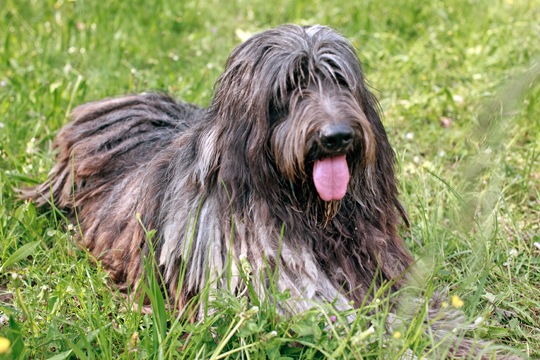 People who find themselves dealing with a Bergamasco for the first time, are generally worried about taking care of its coat. 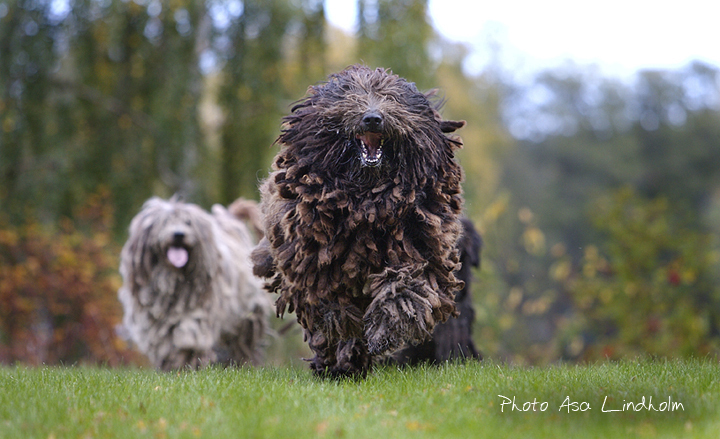 They are full of doubts and uncertainty: is it true that a Bergamasco should never be brushed? What should I do when large bunches of hair take form? ... etc. In reality, things are not nearly so complicated as they appear to the novice who may also be handicapped by all sorts of prejudices most of which are incorrect. 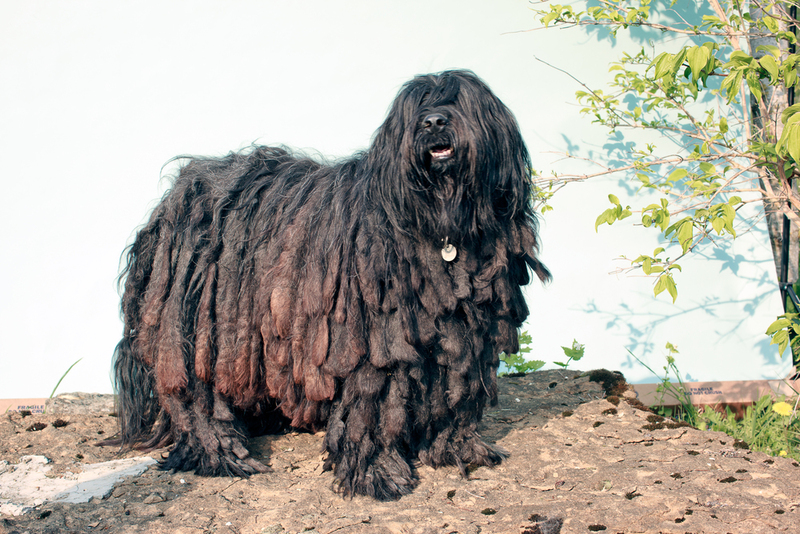 In practice, the Bergamasco's coat needs little care, but applied at the right moment. To make things clear, we shall discuss the interventions which are required from time to time, dividing them into periods compatible with the dog's age. We must, however, stress that these divisions are only indicative and may have to be modified according to circumstances. Not all individuals start growing an adult coat at the same age, but show variations depending on certain hereditary dispositions or on seasonal and environmental conditions. 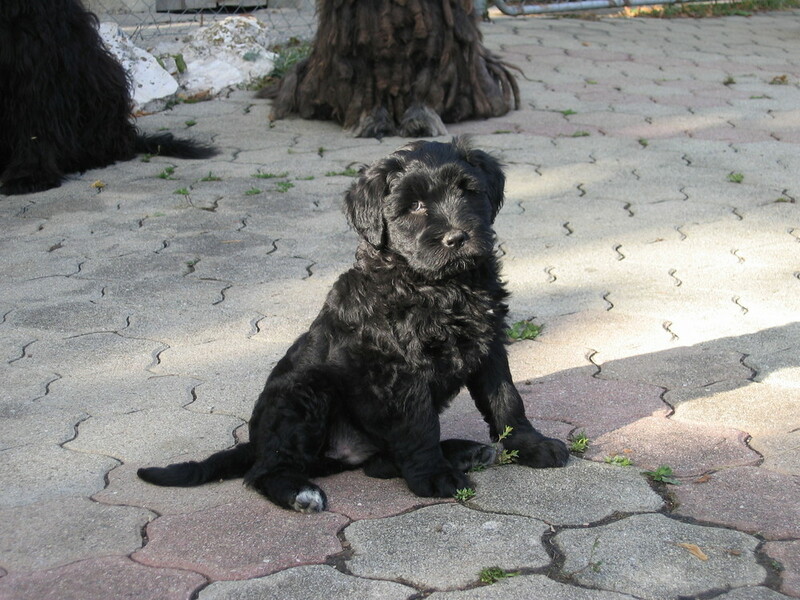 During this period, the dogs have puppy coats, soft and short. This coat shows no felting tendency so that occasional brushing with a steel toothed brush is sufficient to keep it in order and remove dirt among the hairs. Around the 10th to 12th month (individual variations and seasonal variations are very common) the formation of hair with different texture begins, together with moulting of the puppy hair. The first visible sign of this is that the coat seems to rise, as if it were blown up due to the growth of the fine, abundant undercoat which blends with the puppy hair which is gradually moulting. Commencing at the rear of the body, on the croup and back legs, the woolly hair makes its appearance whilst, first on the tail and later in the withers zone, the goat hair starts to form. From the withers, it will successively extend over the whole saddle and, in slightly smaller proportions, over the rest of the body, mixing with the woolly hair. This is the period during which the coat requires the most careful and concentrated attention. The soft puppy hair whilst moulting mixes with the undercoat and with the woolly and goat hair in formation. This creates shapeless clumps, often tangled and one must be very careful not to let them felt as this makes it more difficult for the adult coat to grow properly. On the other hand and against ones natural instincts, one must limit brushing to a minimum, substituting it by opening up the clumps by hand. We must be careful not to open up the clumps completely because this period coincides with the initial formation of the typical maps. During this manual operation, it is necessary to part the clumps right down to the skin, but not to divide them up too radically at the base of the future maps which, on the contrary, needs to be quite large and consistent. One should, therefore, divide the coat into strands of 5-7 cm in width. Only at this point should one use the brush and only to stimulate the hairs which stick out and which would otherwise rectangle with the maps so that our work would have been in vain. If we have started our job too late and felting has already started, it could be difficult or even impossible to open up the clumps only with the hands. In this case, one can use a pair of scissors, but only in the direction of the maps i.e. from up to down. This operation should, however, be limited to an indispensable minimum . This work should be carried out all over the body except on the saddle. Since only goat hair is present there, the whole saddle requires brushing. Here it could be the case that puppy hair mixing with the undercoat and the goat hair forms clumps, but the absence of woolly hair in the zone makes them different from those which form on other parts of the body and they are easier to disentangle, by hand or with the brush and, finally, the comb. In any event, in this region the clumps must be opened up completely in order to reveal the goat hair which should be flat and orderly. After we have carried out all this work, we must not be disappointed by the appearance of our dog. Bergamascos are not particularly attractive during this period. All the budding maps stick out in all directions, making the dog look messy and clumsy. We just have to be patient and wait for the maps to grow and assume their permanent form. Only around the age of 3 years will the coat be fully formed and even if the maps are still relatively short, they will be capable of constituting a dignified "skirt". After the adjustment period, the coat requires very little care. The saddle always needs combing, especially at the end of the Spring moulting period when the abundant Winter undercoat falls out and causes clumps in the goat hair.The maps on the rest of the body need periodic checking to make sure that they do not get too wide. In this case, they should be divided so that the coat maintains an orderly appearance. For the sake of clarity, we shall indicate the various body zones where the three hair textures and their different distribution can be noted. On the saddle and the upper part of the neck, there is only undercoat and goat hair. The coat is smooth here and should be brushed regularly in order to remove dead undercoat hairs and keep the goat hair looking smooth and fresh. Under the saddle, at shoulder level and below on the underside of the neck and on the chest, the presence of woolly hair is evidenced by the formation of maps, but the woolly hair is not as plentiful as on the rear of the body, but is mixed with the goat hair which is abundant here. As a result, the maps in these areas are softer and thinner. On the forelegs there are also agglomerations of long, fine and soft hair. These are, however so plentiful that they make the limbs look like solid, hairy columns emerging from the thick coat over the body which mask the joints. On the rear of the trunk, over the flanks and on the rear limbs, the woolly hair is clearly preponderant so that the maps are thicker and stiffer there due to felting of this hair in contrast to the goat hair. These maps are also longer and tend to increase in length as the dogs get older. They grow down from the croup over the back legs, both sideways and to the rear, forming a wide "skirt". Apart from keeping the saddle tidy and dividing the maps which are too wide, in order to keep the coat in top condition, regular brushing is required all over it, even where the maps are present. This should be done with a steel toothed brush with fine, curved teeth, approximately twice a month. Brushing is necessary in order to tidy the coat and to remove dirt. This can not disturb the maps. Once these are properly formed, no correct amount of brushing can alter their internal structure. Frequent baths are detrimental to the Bergamasco's coat. The use of shampoo is not recommended as it dissolves the natural oils secreted by the skin for the purpose of creating a protective film around the hairs to make them waterproof and protect them from contact with any external agents. Without this protection, the coat would become more dirty and the skin would dry out . This is a danger to be avoided at all times in the Bergamasco, because drying out of the hairs which hold the maps together could cause them to fall out. In view of the length of time it takes for them to grow again, the dog would not resume its normal aspect for many months. A good rule for Bergamascos is not to give them a complete bath more than once or maximum twice a year. They should be washed in plenty of water with only a very small dose of detergent. If necessary, one can wash the parts of the body which tend to get dirty easily at more frequent intervals i.e. the extremities, around the mouth to remove food remnants. Again, use plenty of water and very little soap. Another piece of advice is to avoid use of a hairdryer unless absolutely essential. This dries out the hairs with the consequences we have already discussed. Whenever possible, choose a sunny day with a bit of breeze to wash your dog and let it dry naturally. If it is absolutely unavoidable to use a dryer, remember to add a good dose of cosmetic oil to the last rinsing water to limit drying out the hair to a minimum. 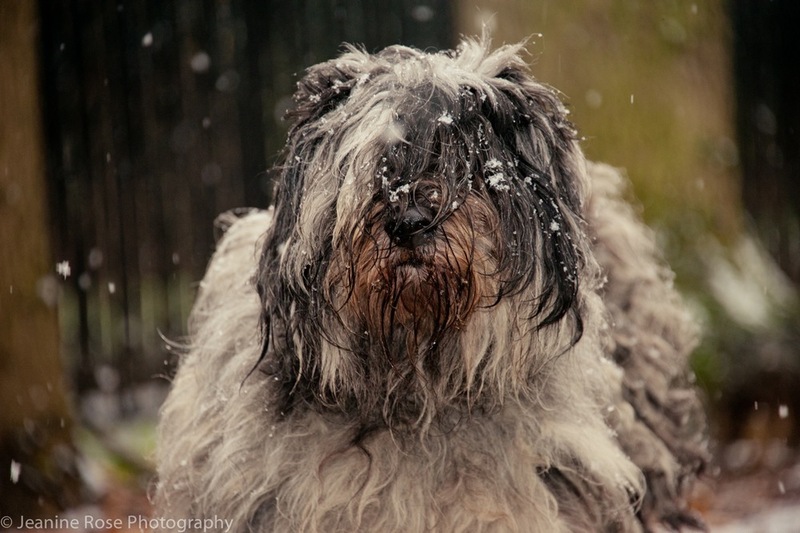 From the above, I hope it is now clear that despite its complexity and abundance, the Bergamasco's coat does not require a great deal of attention in difference to the coats of many other breeds which require constant grooming. 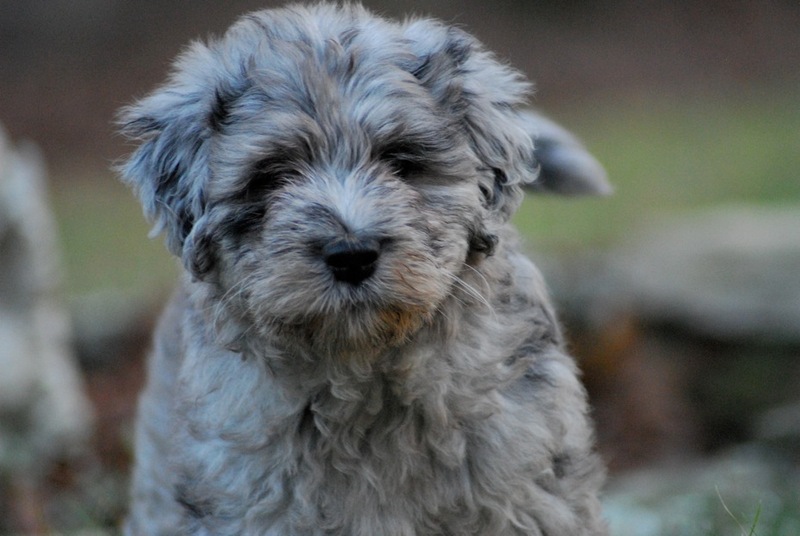 The Bergamasco is a simple, uncomplicated dog which has remained close to nature and this is also reflected in its coat which forms and develops spontaneously. All we need to do is check its development, intervening as little as possible and with the utmost precaution when indispensable. 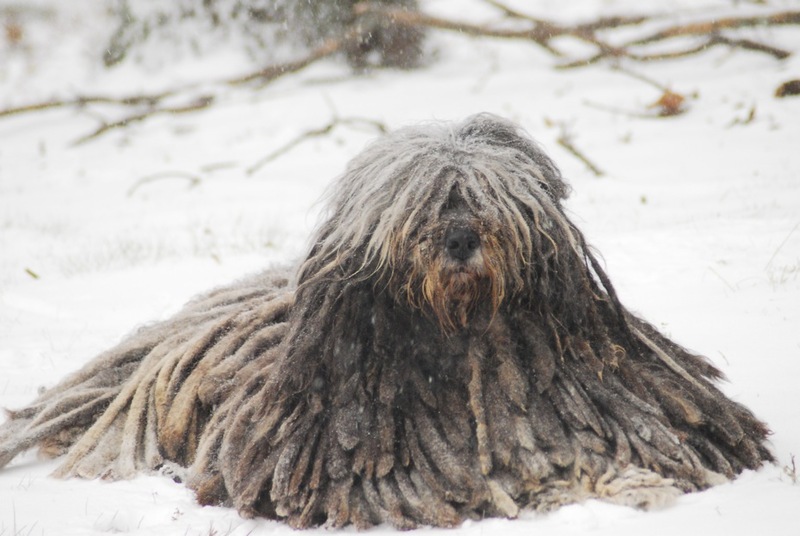 With regard to its coat like for everything else which concerns it, the Bergamasco is capable of fending for itself and finding the simplest and most natural solutions without assistance.